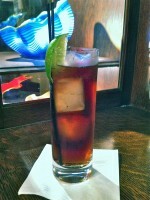 This installment of the Drink of the Week is actually the last drink of 2010. 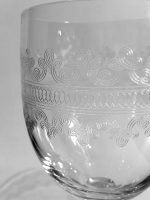 If you have been following along, that makes 52 cocktail recipes posted over the past year, not including homemade ingredients and numerous other posts in-between. It has been fun to keep the momentum going with weekly features. We want to say thanks to everyone who reads and subscribes to Summit Sips and to those who are friends on Facebook or who follow via Twitter. We especially appreciate those of you who see fit to comment on the posts. Part of the fun that comes with these recipes is hearing what others are trying and discussing the results. 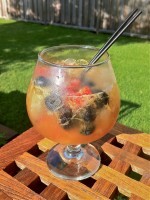 To see all of the 2010 Drinks of the Week on one page, we created a special 2010 DOTW Archive. We want to end the year with a fantastic cocktail, and the Last Word seemed appropriate, not only in name, but in what it represents for the mixologist, craft bartender and home cocktail enthusiast. Here's a drink that not only tastes absolutely amazing, but it is also a simple recipe with relatively easy-to-find ingredients. That's a good combination for a recently rediscovered classic. A few years ago, Murray Stenson of Zig Zag Cafe in Seattle spotted this recipe in a 1951 book by Ted Saucier called Bottom's Up. According to the author, the drink appeared some thirty years earlier and is credited to a Vaudevillian performer by the name of Frank Fogarty. Stenson starting serving it at Zig Zag and soon, the Last Word was being featured at better bars all over the world. It's a great example of how a dusty old recipe can return to popularity if the ingredients are readily available. It's also a testament to the fact that a rediscovered classic can still gather wide appeal. Shake over ice and strain into a chilled cocktail glass. We'll say it for the last time this year, it doesn't taste like gin. But the botanicals in gin take this drink places that vodka never would. Here's another excuse to buy some Luxardo Maraschino. And if you have been wanting to build your collection of spirits, it's time to finally add Green Chartreuse to your cabinet. These are both easy to find, and there are other cocktails you can make with each of them. Finally, fresh lime juice gives the cocktail some bite. It's a wonderful combination. Luxardo and Chartreuse in one drink—what more could you ask for? The nutty, funky character of the maraschino layers so nicely with the potent herbal notes of the Chartreuse, and the sour lime keeps everything in balance. It's refreshing, complex and delicious. Try the Last Word, then leave a few words of your own in the comments below. Cheers, be safe and Happy New Year! The good news is that a bottle of Chartreuse will probably hang around with you for a while since it appears in most cocktails as a component and not the base--unless you find yourself making Swizzles. At that point it becomes an expensive GOOD habit! And then there's yellow Chartreuse. It took me a long time to justify getting a bottle of yellow since it comes up even less often. However, the Norwegian Wood cocktail alone makes it worth having, especially since it will probably take years to use it up. ...and you might want to buy the Chartreuse soon. It's going up in price by $10. There are still bottles around in the Twin Cities for $40. Buy them while they're hot! And one should get the yellow Chartreuse. The Champs Elysées and San Martín are two other wonderful cocktails that use it. Although that was nearly eleven months ago! Amazing that it has taken this long for the inventory in the Twin Cities to finally catch up to this change. 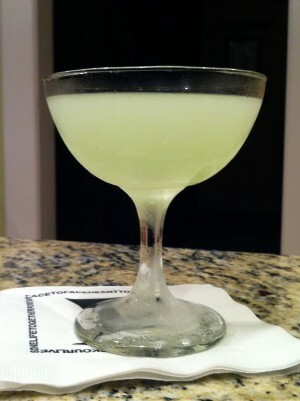 I actually tried the Last Word again last night with a twist. I used a little less maraschino and swapped in Yellow Chartreuse and egg white for a frothy "sour" style. It was great, so if you can only find the Yellow, there's still room to make a version of this drink. Excellent choice for the final drink of the year. If I wasn't all punched-up right now, I'd make this post-haste. Maybe tomorrow. Thanks for all the great recipes this past year -- looking forward to an even bigger 2011 for you. Happy New Year! Thanks, David. Happy New Year! Randy - I just mixed up a couple glasses of this wonderful drink. You are absolutely right in saying although it's a "gin" recipe, it has something that vodka could never bring to this drink. I did have to substitue lemon for the lime (no need to lecture me - i broke a cardinal rule by running out of limes) but it tastes delicious and satisfying. looking forward to the next 52 drinks in 2011! Actually, lemon is a good substitution. It would have been a lot worse had you run out of ice! any suggestions on the gin used? the place i work doesnt have plymouth but we basically have everything else. i would love to see this drink make it into our repetoire. cheers! Kyle, I think you can probably use anything. I made one tonight using Bol's Genever and I loved it. If that's not trying something with bold flavor, I dunno what is. I'd suggest making a few different ones scaled down to tasting size using each gin you have and pick the one you like. The lime and Chartreuse are going to stand out, so it may not matter so much. a question I've been meaning to ask .....here/now is as good as any. I have a bottle of Maraska Maraschino that I've had for quite a while. my wife doesn't like it. the question is "is Luxardo very different?" I could just get a bottle and see but I'm currently under a "no new bottles until an old bottle goes away" rule w.r.t. liquor cabinet space ;) thanks all! Great question. I have never done a side by side test, but the general consensus is that Luxardo has a more complex musty funk flavor while Maraska is sweeter and has a stronger cherry flavor. I have read comparisons in cocktails that say Luxardo can obscure lighter elements and Maraska allows more flavors from gin for example to come through. That kind of review makes me think there's no reason to have both on hand, but it might be worth replacing with the other brand when you get close to empty so you have a small overlap to compare them yourself. Preference is apparently not universal--it's subjective and maybe even cocktail recipe dependent. Way to go with the Last Word! It's definitely one of our favorites. Now that you have Chartreuse, check out the Champs Élysées if you haven't already. It's like a brandy version without the maraschino liqueur.